The space in our home that I have been wanting to fix up the most lately is our home office / playroom / schoolroom. Yep, that’s right – my family of five works, plays and learns all in this one space in our home. It’s exciting and fun and exhausting… and we wouldn’t change it for the world! 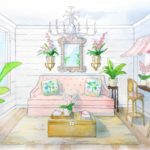 So creating a room that is both practical and inspiring is important to us and definitely my favorite kind of challenge. I recently made some progress on the office space part of it and am excited to share a new line that really helped me bring it to life! 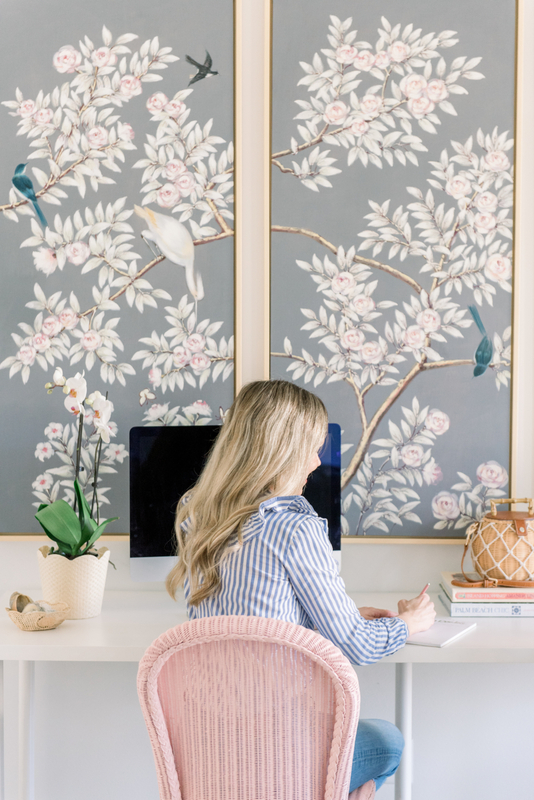 My vision for the space includes a home office wall, a schoolhouse wall, desks and chairs for the kids, and our comfortable old couch for reading and snuggling. 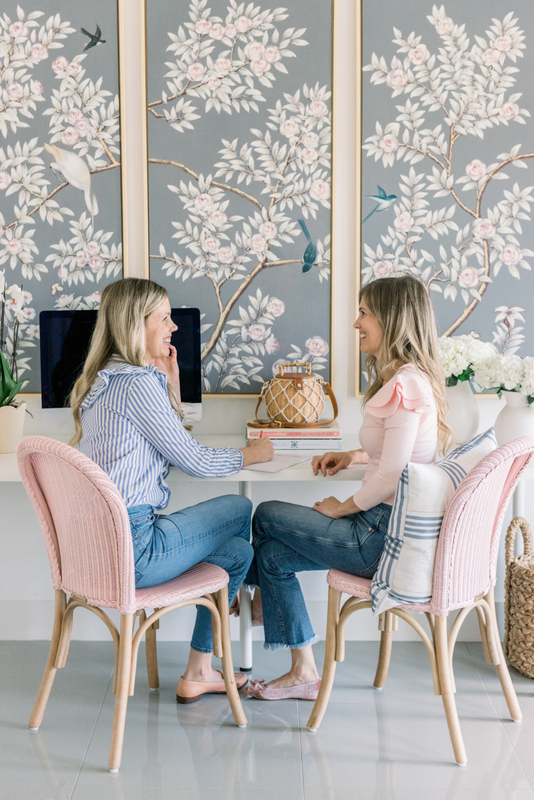 When I started pulling this room together, Brooke & Lou, the new “life-friendly” home decor line by one of my favorite interior designers, Bria Hammel Interiors, launched at the perfect time! 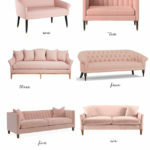 Bria is known for designing “fresh, refined, welcoming spaces” and her new line, Brooke & Lou, offers a whole collection of pieces that help to create beautiful spaces that are livable, too. 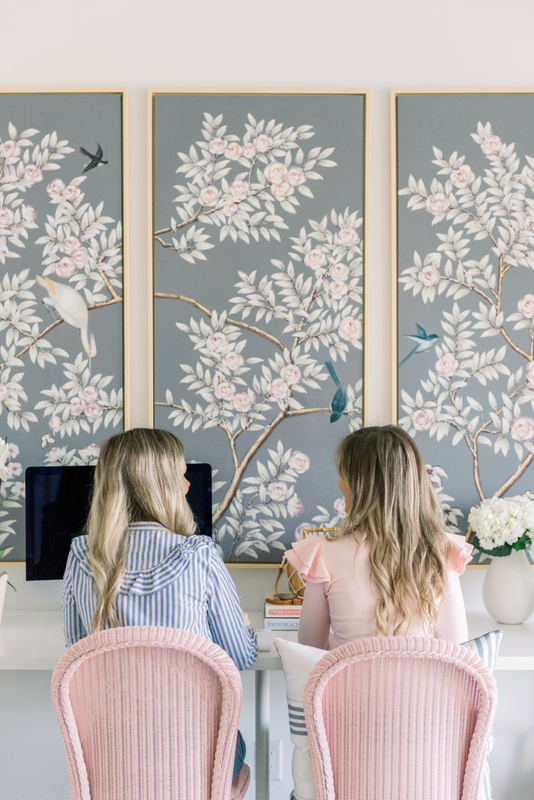 Named after Bria’s two young kids, Brooke & Lou features a whole collection of products that are both beautiful and life-friendly. 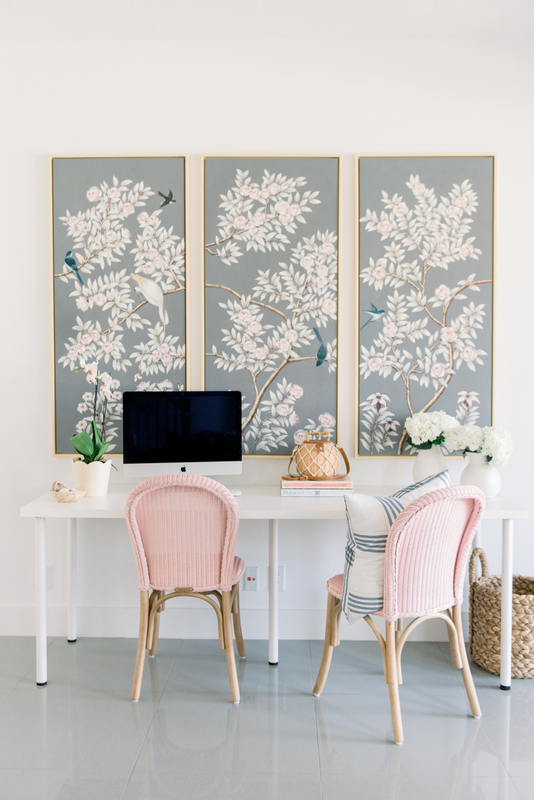 The first pieces that really jumped out at me are these rattan Draper Chairs that come in blush, white, or blue. They are stain resistant and wipeable, making them perfect for any high traffic area. 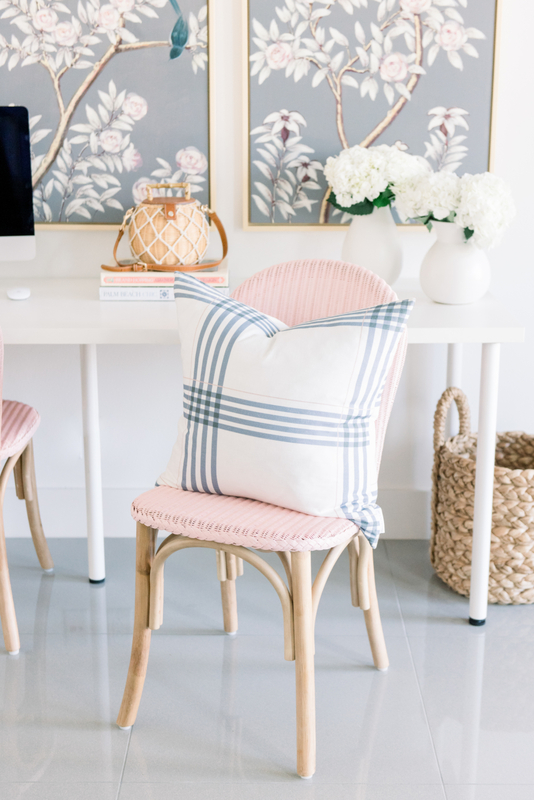 The pair of blush chairs are such a lovely touch of color next to my white desk. 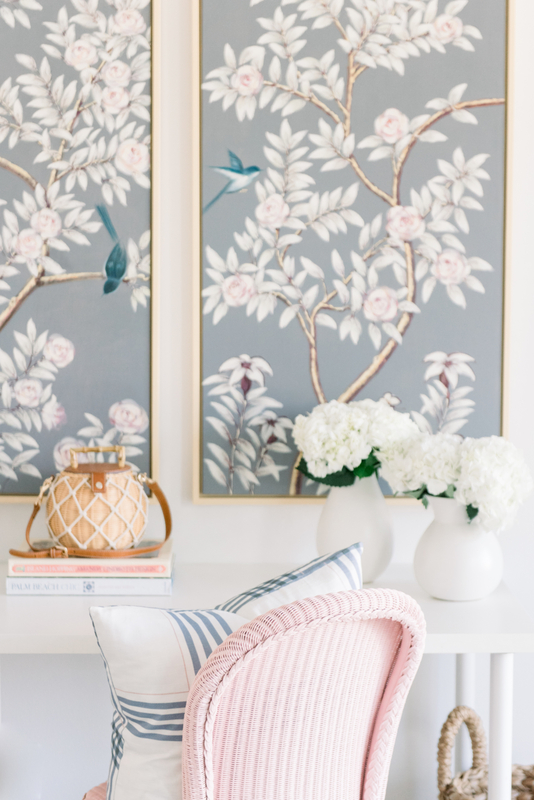 I also love her collection of pillows and thought her Oxford Plaid Pillow in periwinkle would be the perfect balance to the blush! P.S. Also, how stunning is the artwork above my desk by Frontgate?! It was my jumping off point for the room and makes a reallllly pretty focal point. This particular piece is currently sold out, but will be back in stock in February! They also have this similar style!